With weekly markets in nearly every area of Mallorca, it can be hard to figure out which to visit, particularly if you’re limited for time. Some are better for local produce, others for their leather and souvenirs, and some are just nice places to wander and people-watch. Most markets are only open in the mornings, so it’s best to get there early to bag the best bargains. So grab your shopping bag and browse our guide to the best markets in Mallorca. The Thursday morning market in Inca is the biggest on the island, and wandering through it feels like the stalls might go on forever. At first glance, it seems as though there are mostly stalls selling cheap tat, but on further inspection there are plenty of quality goods, too – the market is so huge that it can take a while to get your bearings and figure out which sections are better than others. The artisan craft stalls are generally very good and have wooden items, baskets, olive oil and delicious deli-style foods. Inca is famous for its leather goods, so there is an abundance of stalls selling shoes and bags. Both tourists and locals come here to shop, with many people arriving by train from Palma, which is an easy (and cheap) half-hour journey. 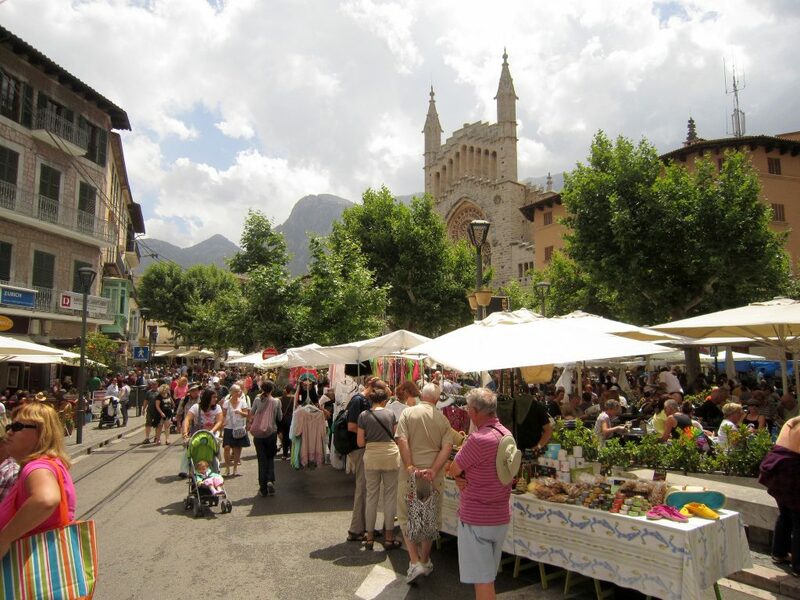 The beautiful town of Soller, nestled in the Tramuntana mountain range, is a wonderful place to wander around on any day of the week, but Saturday is market day and the streets are alive with colourful stalls and shoppers. Numerous stands fill the main square and its side streets, selling baskets, crafts, clothes and Soller Valley produce. After browsing the market, use the opportunity to jump on the vintage electric tram and visit the pretty Port of Sóller and its sweeping bay, just 15 minutes away. Many towns hold nightly craft markets throughout the summer season as well as during Christmas and other holidays, and Palma de Mallorca is no exception. The summer craft market on the edge of the buzzy La Llonja (or Llotja) district runs along Passeig de Sagrera and is open late. The long line of nicely lit stalls sits between rows of palm trees and mostly sells handmade jewellery, bags and various other artisan craft items. This market makes for an enjoyable post-dinner stroll on a balmy evening and is a good place to search for a gift that’s less trashy than what’s on offer in most souvenir shops. 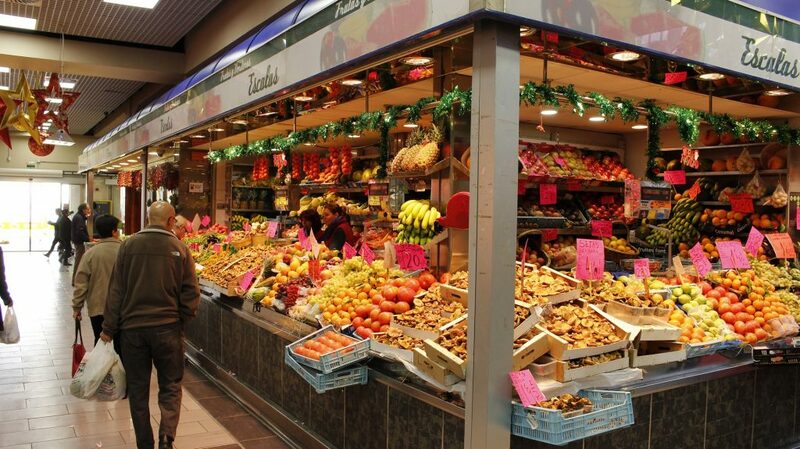 The Olivar Market (Mercat de l’Olivar) in Palma is a large indoor food market with stalls selling mountains of colourful fruit and veg as well as meat, cheese and other deli items, and a fish market in an adjoining building. The produce on offer is high quality, and the market is a fantastic place to wander and is quite a feast for the eyes, even for those not looking to shop. Expect to mingle with locals doing their weekly shop, often combined with a quick stop for coffee (or something stronger) and a chat. It’s a great place to shop in a less touristy, more authentic market environment – have a sneaky tipple and some tapas on your way round. Established in 1306, Sineu is one of the oldest, most traditional markets morning in the town’s main square. It was originally an agricultural and livestock market but nowadays, as well as being a farmers’ market, it sells crafts, handmade leather shoes and other goods. Small animals are still for sale, but there are also pony rides for kids. As with most markets, it kicks off early (8am) and gets very busy, so aim to be there before 11am, and make sure to stick around to have lunch in one of the many traditional Mallorquin restaurants near the market. 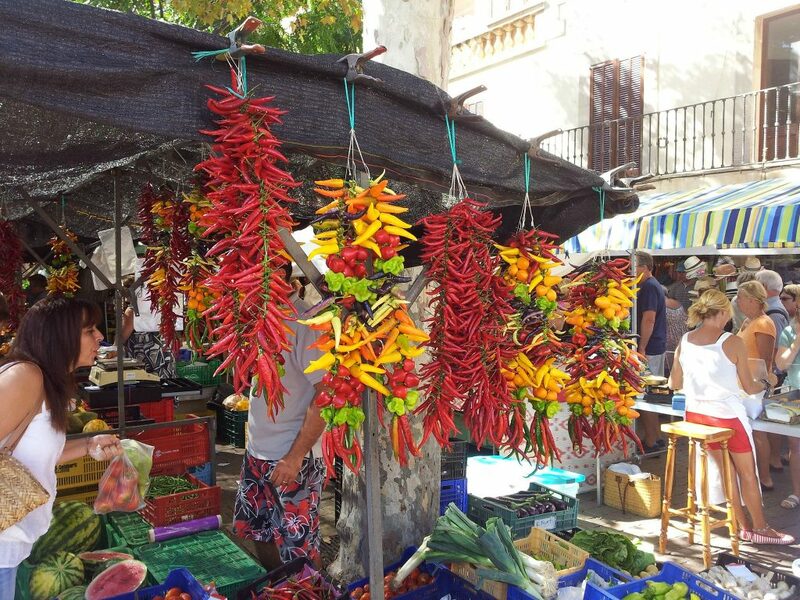 Alcúdia’s market takes place twice weekly, and its spectacular location in the old town near the medieval city walls and the Roman ruins of Pollentia make it one of the most popular markets on the island for tourists. The market sells a variety of items, from fresh produce to souvenirs, clothes, shoes and baked goods – no different to that sold elsewhere, but a market day visit is a great opportunity to see the old town in its most vibrant state (and combine shopping with some sightseeing). The market is also within easy reach of the resort town of Port D’Alcúdia.